The conference I attended in Prague took everyone on coach trips to encourage communication and friendship among the faculty members attending. It was a really neat way to get to know attendees from around the world. 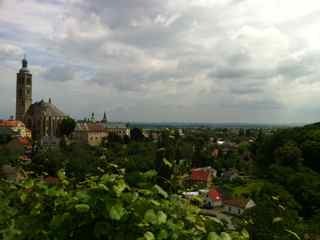 The trip we went on was to Kutna Hora, which was about 1:15 minutes from the center of Prague. 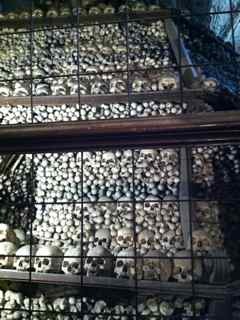 The main thing here was the bone church, which began in the 13th Century and with wars, and plagues over the years, began to get very crowded with human remains. 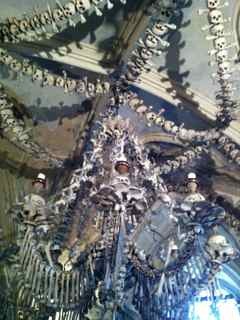 It’s believed there are about 40,000 remains here and they have been made into various “decorations” such as chandeliers and towers. 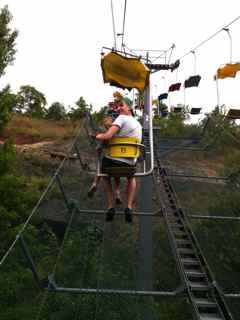 I worried it may be too scary for the children and they were tense going in but then we all really felt nothing much. Max said it was scarier online with the background music. I think the mass of tourists just kind of made it rather Disney’ish plus the people died so long ago from more natural causes that it wasn’t eerie. I actually thought the Jewish Quarter in Prague to be far more unsettling and sad. 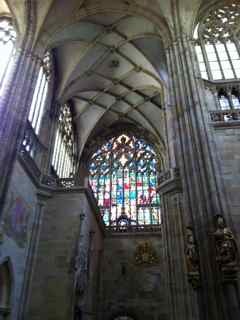 We went onwards to the town, which again has beautiful old cathedrals, and buildings that impress. This smaller town though was less developed than Prague and very quiet outside of the main square. Pretty but wouldn’t go other than it’s a beautiful big church. 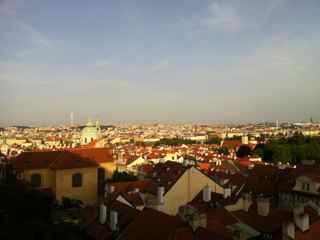 Our friend Mixon is Jewish and was in Prague last year so on her advice we headed to the Jewish area which for centuries was one of the largest ghettos in Europe and very well developed and organized. It goes back to the 12th century with oldest synagogue (the Old-New Synagogue) dating from the 13th Century. Today there are six synagogues, the city hall, and the old Jewish Cemetery. We bought the muli-tickets for all and so got to see most places. The cemetery is incredible with reportedly 20,000 headstones in there and many more layers of bodies beneath. The oldest is 1439! During WWII the Jews in Prague were all forced to live in the Ghetto area before being shipped off to the concentration camps. Most were killed or never returned to the area. In one synagogue there was a moving exhibit of children’s drawings all done while in the ghetto or Terazin (the nearest concentration camp). This was very moving to me as were many of the pictures and displays in the other synagogues. It is hard to imagine the thriving community this once was just disappearing almost over night. It made for some very deep discussions with the children. Very moving for all of us. No pictures of the synagogues or cemetery as you had to pay an extra fee for this and we didn’t realize this when buying our entrance tickets — pay ahead if pictures are wanted. So here are a couple from the area. The last night we had dinner on the Old Town Square and it was the European cup final so filled with a huge screen in “fan central.” It was very fun and rowdy despite the team we wanted to win (Italy) losing to Spain. As we headed back to the Charles Bridge to cross over to our side, it started to drizzle and then as soon as we were on the bridge the heavens opened and it poured. The lightening also started so was quite apocalyptic feeling walking across a medieval bridge with huge statues looming out of the darkness and black water below. We got absolutely soaked through and really just had to laugh as luckily it was warmer than in England! It was memorable for sure! We all enjoyed this city and are glad we went but none of us could imagine living there (which is what we often chat about in new places) or even racing back for a visit. Far too many tourists – the place is jam packed – and more than anything, more Americans than any other city we have been to! Apparently it’s not so full in the fall and spring so perhaps then would be the time to go. I don’t really enjoy going to a foreign city and all I hear are American voices everywhere – prefer the less traveled locations. Budapest won over Prague and we are actually now thinking even further into Eastern Europe would be fun – Sofia or Dubrovnik perhaps! 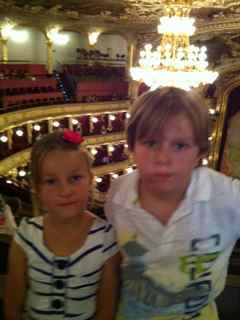 Some of the major highlights in Prague were the state opera house and zoo (ditto Budapest). 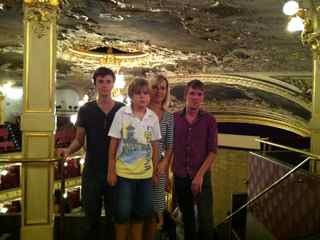 We went to see Carmen at the opera and again were blown away at the quality of the entire show. The children sat glued to it as did I. It was not quite as hot in there but still warm. Tickets were a lot more expensive and our cheap seats cost about $20 a person this time instead of $2. The zoo is the biggest in Europe and did impress. We spent about 5 hours there as it was outside of the city and on a hill so had lovely views plus was slightly cooler. The Littles rode horses twice and we got to see some different exhibits. 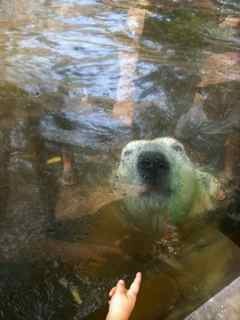 Two baby gorillas playing were neat and the polar bears up next to the glass were impressive. It’s funny how culture comes through even here though as the snakes were being openly fed large dead rats and the trainer was doing a show feeding the otters (which used to be one of my favorite animals). Usually in the US they throw a few fish in but in this case they had dead ducklings – cute little yellow babies! We were a bit stunned to watch the otters ripping these apart violently and chomping down. Adds a whole new side to otters to see them with duckling feet hanging out of their mouths. I’m afraid we were squeamish and didn’t stay around there long. We did find great t-shirts for the Prague zoo that were half the price of tourist t-shirts in the main stores so perhaps things are cheaper away from the main city! 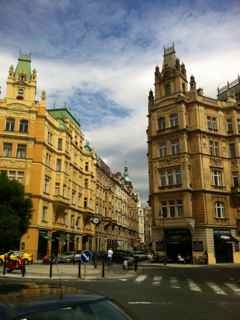 Jake took off and did the Communist Prague tour and went to the KGB museum, communism museum, and sites in Wenceslas Square as well as the Kafka Museum. 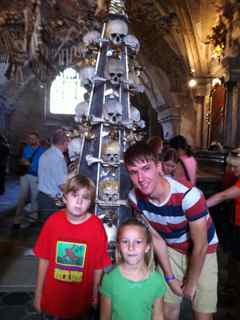 The others and I did the castle with full tickets so we went into all the buildings and various museums. It’s the largest castle compound in Europe and it certainly takes a full day to see everything. Max got a new pocketknife from there and got to shoot a crossbow so was happy. 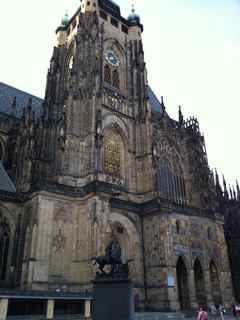 We only had 2 days back in The Netherlands and then headed out to Prague for a week. 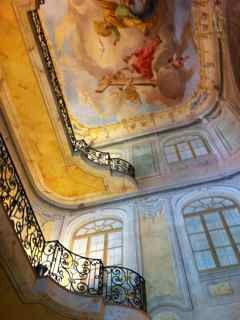 I had a conference to present at and so we rented another apartment which turned out to be in a fantastic location and with great service. http://apartments-in-prague.org/ Ivo organized a pick up at the airport service (40 euros for a large van) and the concierge was there to let us in and give advice on local area etc. They had a cell phone for us to use and all the expected items in a 2 bedroom, 2 bath apartment. 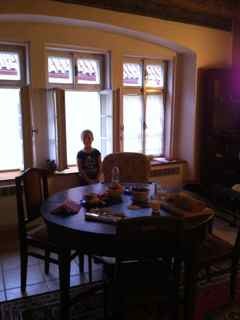 It has lovely old wooden, painted ceilings and sturdy antique furnishings and was just down from the castle area. We were across the street from the American Embassy although didn’t’ know this until our taxi was stopped and searched by police – all vehicles in the area are. 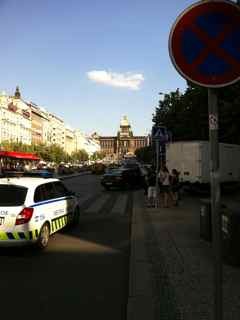 The driver claimed we were in the safest spot in Prague as the other side was a police station! 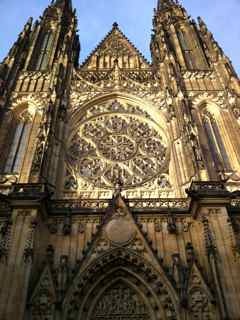 Prague is lovely and the cathedrals and castles intertwine with amazing architecture. We kept coming across rather nondescript big buildings wedged between apartments and shops and upon looking in, we found them to be these incredible churches. The outside is very plain but the insides are highly ornate. 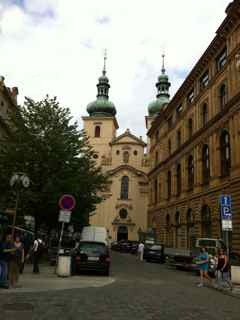 The first evening we were walking and passed a huge church with a sign that said classical music concert. As we were reading it, a man was gathering up the signs as he said it was just starting. We looked disappointed and so he said “come, come” and pulled us inside to sit. We got to listen to an hour long concert of Mozart and more in this beautiful venue for free – what a gift. We later saw that most of the churches has concerts a few times a week as fundraisers but they were not cheap! 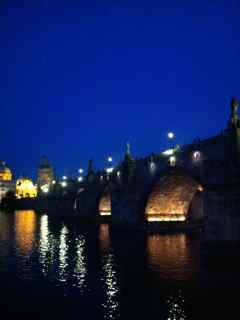 As we walked home after a good dinner and the concert we stood on the Charles Bridge admiring the sites when suddenly explosions went off around us. After the initial shock we saw the fireworks going off right next to the bridge and so got another free show – a 15 minute display so close the ashes of the paper fell on our heads! Pretty impressive. We got to see these a couple of times in the week and they seemed to be a nightly occurrence at about 9:45 pm. When we inquired about the fireworks from a waitress she shrugged it off saying must be someone’s birthday so I don’t know if this happens all the time (of course she was just openly rude about everything so who knows). 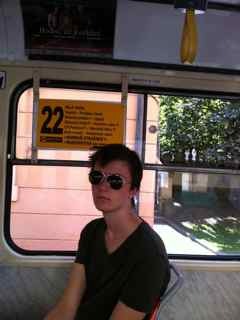 That was actually a big downside to Prague. People are RUDE. In Budapest the culture is a little cooler and standoffish than in the west but it’s easy to see this is a cultural difference. However we had some really unpleasant interactions in Prague and service workers and the general public across the city just really did not seem to be happy or considerate. People don’t smile often and we referred to the “help desks” as the “unhelpful desks” as we actually had people working in these (zoo and airport) who were openly rude and angry at answering questions. It is also very expensive in the tourist areas and the non-tourist areas harder to access or find. We are pretty good at managing on public transportation but Prague was the most difficult and frustrating although we barely used it as it’s a very walkable city.